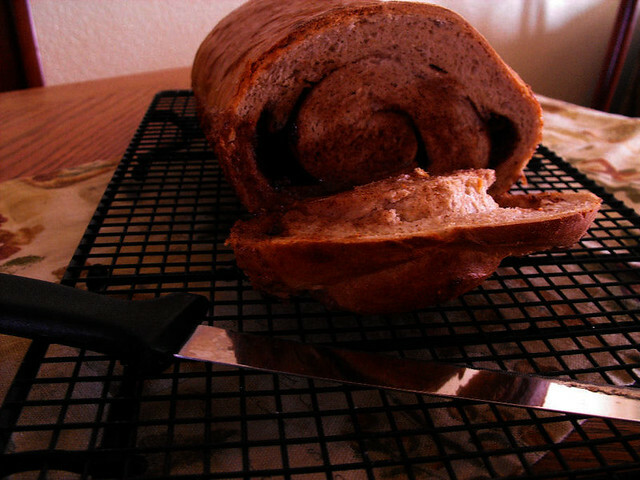 I love Cinnamon Raisin Bread but honestly, at almost $3 for a small loaf, I find myself not buying it as often as I would like. 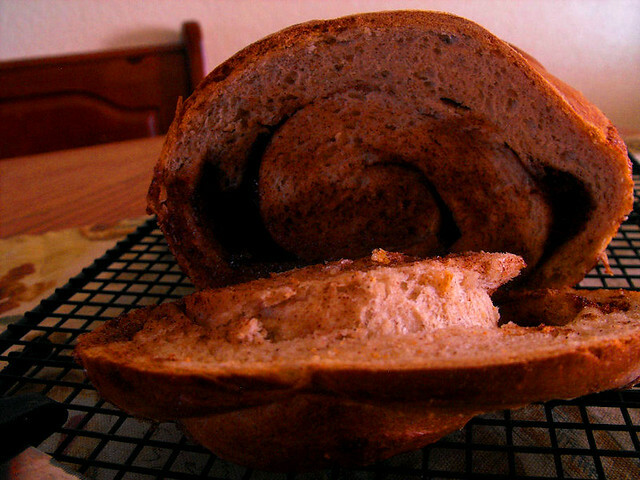 While visiting Annie's Eats, I found a recipe for Cinnamon Raisin Swirl Bread and I just knew I had to give it a shot, I did omit the raisins because I'm the only one that likes them and the kids won't eat it. I made it this afternoon and it not only smelled heavenly but it's DELISH. Go on over to Annie's Eats when you get a chance and take a look around her blog, she has some of the tastiest recipes out there. 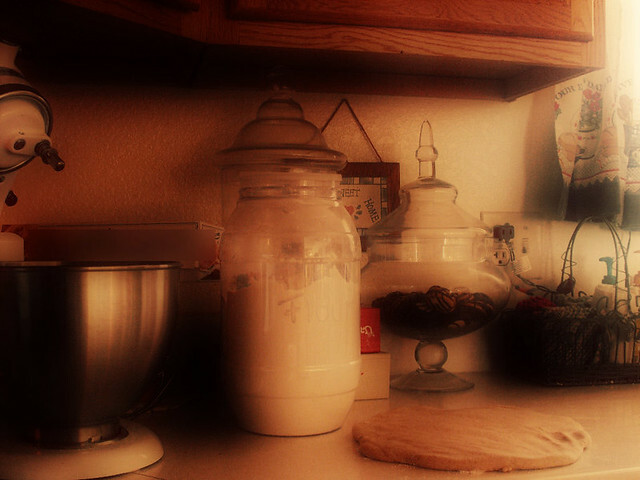 In the bowl of a stand mixer, combine the yeast, warm milk, flour, butter, sugar, egg, salt and cinnamon. Mix briefly until a dough forms. Switch to the dough hook and knead on low speed until the dough is mostly smooth and clears the sides of the bowl, about 3 minutes. Add in the raisins and allow to continue kneading about 3 minutes more, until the dough is smooth and supple and the raisins are evenly incorporated. Transfer the dough to a lightly oiled bowl, turning once to coat. Cover the bowl with plastic wrap or a clean kitchen towel and let rise in a warm place until doubled in bulk, about 1 hour. Fold the bottom third of the dough up and fold the top third down, in business-letter fashion. Then fold the right and left sides into the center in thirds, forming a rectangle. Press down to seal. Return to the bowl, cover and let rise again until doubled, about 40 minutes. Generously butter a 9 by 5-inch loaf pan. To make the filling, combine the sugar, cinnamon and water in a small bowl and whisk until well combined. Return the dough to a lightly floured work surface. 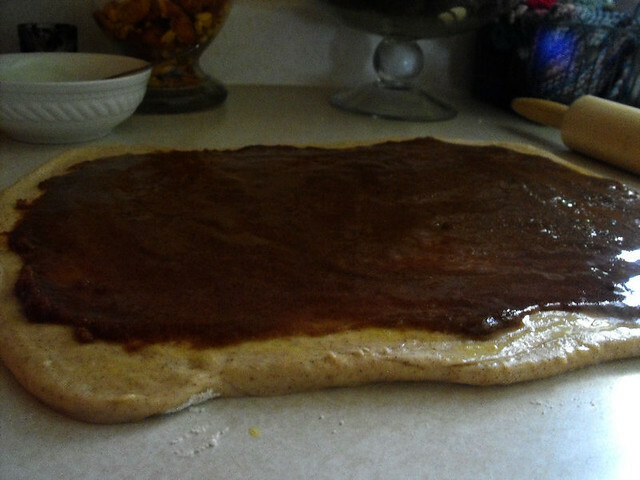 Roll the dough into a 10 by 12-inch rectangle. Brush lightly with the beaten egg. 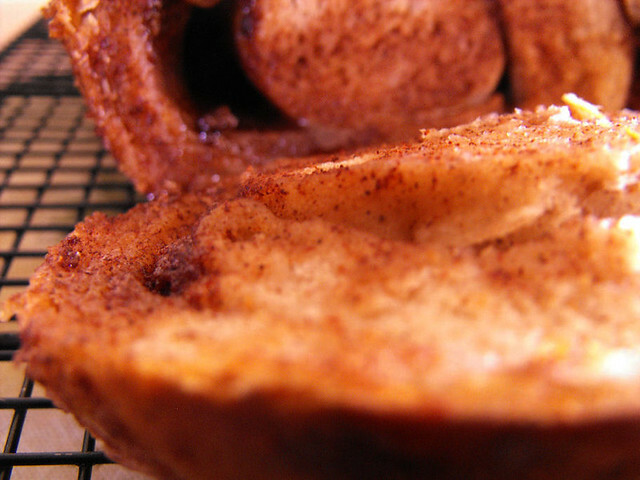 Sprinkle with the cinnamon-sugar mixture, leaving a thin border around the edges. 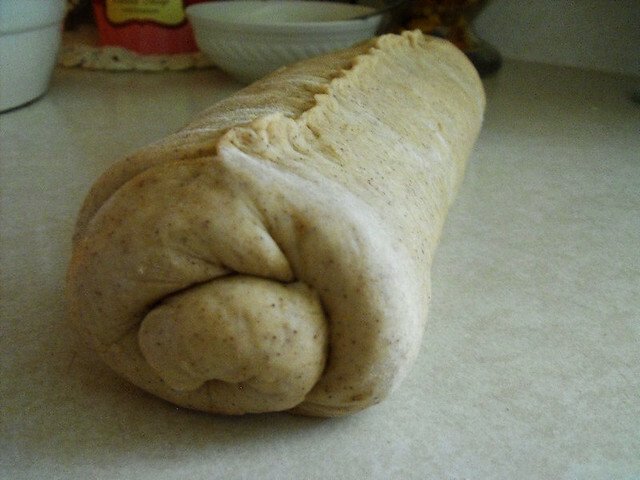 Fold in the edges of the long sides of the dough about 1 inch. 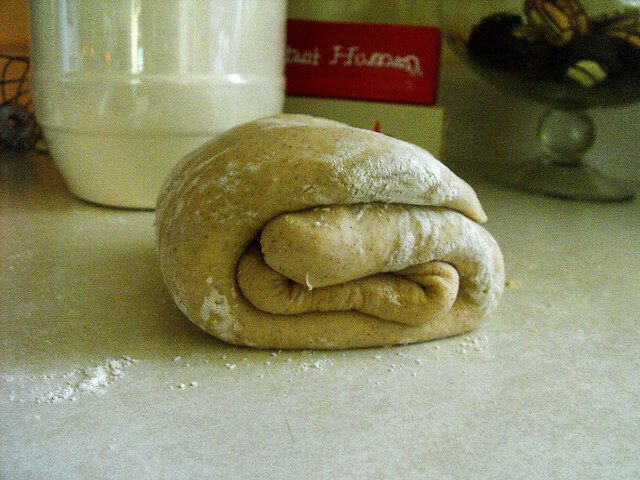 Beginning with one of the short ends, roll the dough up into a tight spiral log, gently pressing as you go. Pinch the seam shut, and place the loaf seam side-down in the prepared baking pan. Cover loosely with plastic wrap or a clean towel and let rise until the dough rises just above the edge of the pan, about 30 minutes. Meanwhile, preheat the oven to 425˚ F. When the loaf has risen, brush the top of the loaf lightly with the remaining beaten egg. Bake, rotating the pan halfway through, until the loaf is golden brown, about 45 minutes. If the surface seems to be browning too quickly, tent loosely with foil (I did this halfway through baking). Cool in the pan 5 minutes, then turn the loaf out and transfer to a wire rack to cool completely before slicing. I love your blog and your fabulous recipes! I have signed up to follow you and would be delighted if you joined me at Create With Joy! This bread sounds awesome! I am going to try and get my mom to let me make it. A quick question though. If we don't have a mixer with a bowl, and therefore no dough hook, how would you proceed?